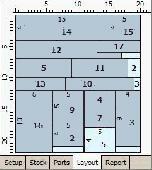 SmartCUT is a professional cutting software package designed for panel cutting optimization. SketchList 3D is furniture design software and cabinet design software that allows woodworkers to computerize furniture design and cabinet design by using virtual 3D boards, drawers and doors. SketchList 3D is furniture design software and cabinet design software that allows woodworkers to computerize furniture design and cabinet design by using virtual 3D boards, drawers and doors. You add, size, pick materials and locate parts interactively, always seeing the result of your work. PLUS 2D - Nesting software for reducing scrap generated by 2 dimensional cutting processes and generating optimum layouts for cutting in sheet metal layout, fabrication, glass, building panel, woodworking. Maximise sheet/panel yield. CutLogic 2D is cutting optimization software, the best way how to save your material, work and time when you need to cut any rectangular (panels, sheets, boards, panes, plates, slabs) material such as wood, glass, steel, plastics, fabric and others. The CUTTING programs are intended for the optimum cut of material to the rectangular or linear details. Cutting Line is intended for optimal cutting of linear stocks into linear parts of different lengths. Cutting Line is intended for optimal Cutting of linear stocks into linear parts of different lengths. It can be used in wood-working, pulp and paper industry, metal Cutting, clothing manufacturing, etc. The program is based on unique high-speed algorithm that enables getting perfect Layout with minimal waste. Sheet Cutting Suite is a nesting software for generating optimized layouts and reducing scrap generated by 2 Dimensional Rectangular cutting processes. Responsive Layout Maker is the ONLY app that addresses the most fundamental aspect of responsive web design: creating a custom responsive layout that optimally supports and present the content at every possible device width.